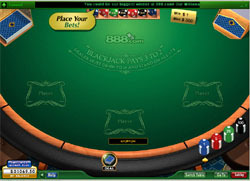 888.com is one of the oldest online gambling companies in the world starting in 1997. 888 offers players many different gaming options including 888 Casino on Net, 888 Pacific Poker, 888 Sport and 888 ladies. The company is now one of the largest gambling companies and has been publicly traded company on the London Stock Exchange since 2005. 888 does not allow US online blackjack players since the 2006 UIGEA when they left the US market to focus on Europe and other potential markets. When you deposit for the first time at 888 Casino you will be eligible to receive a 100% bonus up to $200 dollars or 100 pounds. Many of our readers want to know about playing blackjack at 888.com. They currently offer 3 games at the 888 casino including 21 classic blackjack, crazy blackjack and multi hand blackjack. Classic Blackjack – You have two options when sitting at a 888 blackjack classic table. You can sit at a public table with two other players on either side of you or you can choose to have a private table. If you choose to play at a public table you are able to chat with other players at the table. You are also able to choose your 888 betting limits. You can choose standard which has a minimum bet of $1 and a max bet of $300. There is also 888 high rollers that is a minimum bet of $5 and max of $500. For the ultra high rollers that are also VIP members you can play with a minimum bet of $10 and a maximum bet of $2000. Rules: Blackjack pays 3:2, Dealer must draw to 16 and stand on all 17’s. Crazy Blackjack – This is a more carnival blackjack game. You place a regular blackjack bet but in addition you can bet on the highest hand (2 hands 1:1, 3 hands 2:1) and/or safe bet (12-16 value 3:2) as well as a 777 jackpot (any three 7s $1500, three spade 7s $150k) bet. Multi Hand Blackjack- This blackjack game is the same as classic blackjack but you are able to play 3 hands at a time. 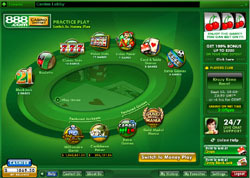 888 currently operates its own casino software which means all of their games are exclusive to 888casino.com. 888 casino net has a large number of deposit and withdraw options for players looking to play with real money. You can deposit with all major credit cards and debit cards including visa, mastercard, diners club, eurocard and more. They also accept E-wallets including Neteller and moneybookers. As well as bank wires, echecks and prepaid cards. To withdraw funds you can basically use all of the options that are availble to deposit. Though, some methdos are faster then others so check the casino-on-net website to find out how long a check usually takes to be processed and delivered. If you are a 888 Gold VIP member your cashouts will take much shorter times then other members because of your high roller status.